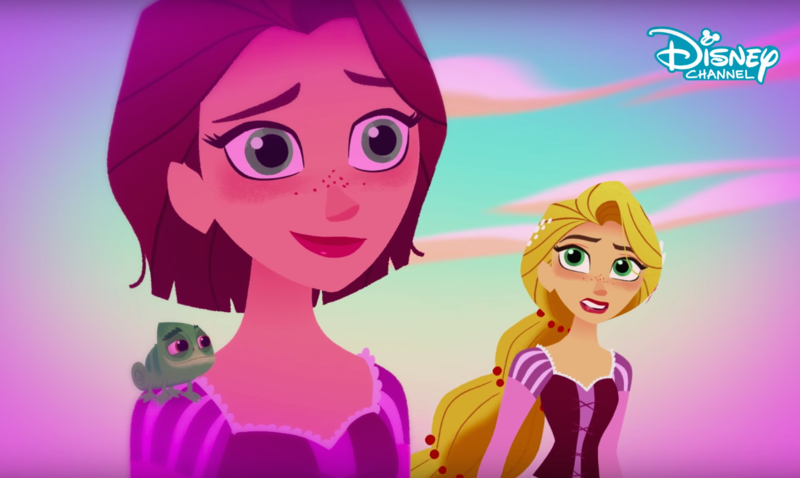 Watch Rapunzel let her hair down in this brand new song from the season finale of "Tangled: The Series"
Are you looking for a way to really let your hair down this weekend? If so, Disney Channel has just the thing for you. Sunday morning, a brand new one-hour episode of Tangled: The Series airs, but friends, things aren’t exactly sunshine and cupcakes in Corona right now. Rather, everything is more like “scary black spikes all around the kingdom and beyond,” and things aren’t looking good for Rapunzel, Eugene, Cassandra, or anyone else during the episode, which also happens to be the *season finale. * Those big, black rocks are betting bigger, and Rapunzel continues to argue with her dad about how to deal with them — and deal with Varian, who last we saw was not too pleased with the princess. Varian’s dad is still very much stuck in the amber, even after stealing the sun drop flower from the kingdom’s vault. Also, spoiler alert, the sun drop flower isn’t the flower anymore — it’s actually Rapunzel. You could say that Blondie is feeling the stress of everything right now, and what better way to cope with that than by bursting out into song? The episode, “Secret of the Sun Drop,” features a brand new song from the OG Tangled musical team, Alan Menken and Glenn Slater. Once again, the voice behind Rapunzel, Mandy Moore, absolutely knocks it out of the park with her vocals. And “Set Yourself Free” might be the new Rapunzel power anthem we need. With lyrics like, “ no more letting someone else define you to a T / you know that you are strong / you’ve know it all along ,” this is exactly the pep talk we need from our favorite barefoot princes to get us through the rest of the day — and/or any difficult tasks that have us questioning ourselves and our ability to take on new challenges. While not all of us have to save the kingdom this weekend, it’s still a good mantra to sing again and again. So as ‘Punzie sings, seize the day and let down your hair, and check out Tangled’s season finale Saturday at 8am on Disney Channel (and on the Disney Channel app! ).